New whitepaper commissioned by OKI Europe says many companies would like to digitise documents to reduce physical storage space. Egham, 12 January 2016 – Just one third of European companies are planning for a digital world with smart MFPs playing a key role in moving away from paper-based processes, a new IDC whitepaper commissioned by OKI Europe Ltd has found. At present, most European companies are using a combination of paper-based and digital documents in their day-to-day operations. 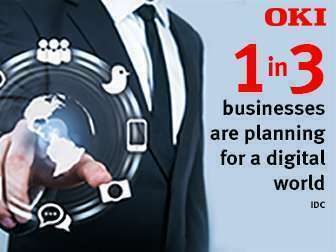 However, a third of businesses are now planning for a future digital world. The whitepaper, which was compiled by Jacqui Hendriks, IDC’s Head of European Managed Print Services and Document Solutions research and consulting practice, is entitled ‘Are your business processes stifling your market opportunity? Cost-efficient print and document management through smart MFPs’. Previous IDC research cited in the document shows many companies would like to digitise documents to reduce physical storage in premium office or offsite space. Here, one of the key benefits of business process automation is in providing the ability to archive documents in one place. By providing access to scanning functionality, users can digitise information for searchable access and scan direct to a specific destination, eliminating the need for a paper trail and moving towards building a digital footprint. According to IDC, the key features that a smart MFP can provide to firms laying the groundwork for document digitisation include the ability to scan direct to email, to a specified folder that may be on a network or cloud-based for further utilisation or archival. This meets the needs of the 66% of European companies who say that one of the key benefits of automating business processes is having archived documents in a single location. Various document formats can also be scanned for output in PDF or PDF/A format, the latter meeting the need for longer-term digital archiving. The IDC whitepaper also found that, at present, document-related processes are contributing to a substantial loss in employee productivity each year. As ‘customisable transformation tools’, smart MFPs unlock substantial workflow benefits, automating many time-consuming manual tasks and enabling businesses to concentrate on activities which promote growth. Tetsuya Kuri, Vice President Marketing EMEA, OKI Europe Ltd.
OKI Europe’s portfolio of smart MFPs combine sophisticated software with advanced technology. These in-built tools provide businesses with a range of functionality needed to improve the way that documents are handled, managed and processed through an organisation and support the growing requirement for space and time-saving document digitisation in busy businesses.